This is a small update to anyone with a VidGrid account. VidGrid, the video platform, will be making several updates to its captioning request system. The first is the captioning system will now be measured in Credits instead of minutes and seconds. Each minute captioned will use one credit. Any seconds needing captioning will be rounded up to the next minute. We recommend that if you want to edit and request captions on a video, that you edit your video first and then make your captioning request. The second part of the update allows users to upload their own captioning files to the system. When users select the captioning system, they can select Upload in the pop-up window. Then, users can select the caption file they created—the system will accept .srt files and .vtt files- and upload for their video. Uploads can take up to 5 minutes; this is due to VidGrid needing to translate the caption file to a transcript. The final addition is the new Dashboard. 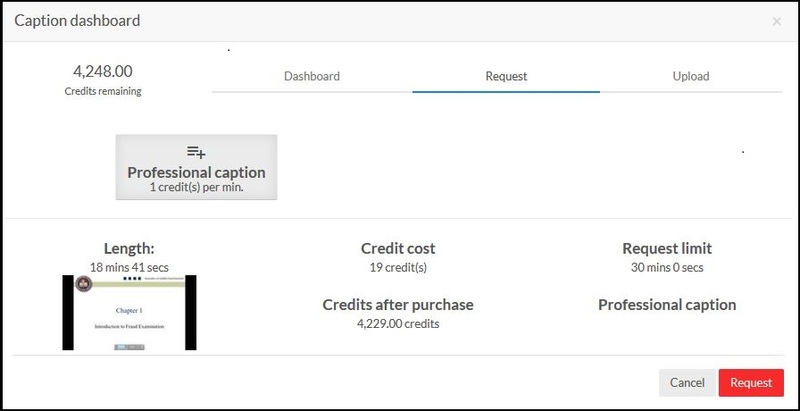 The two most important updates to the dashboard are the ability to view the progress of your captioning request and the option to download a transcript of the video’s captions. The new captioning request service goes live today. If you have any questions, please contact Teaching Innovation and Learning Technologies at tigerlearn@fhsu.edu.